Welcome back! By now you should be comfortable with the ‘why?’ of investing, so we’re going to cover some of the ‘how’. I’ll be introducing Exchange Traded Funds (ETFs) as a means of building an investment portfolio, explaining the main varieties and why the level of fees charged is so important. Why should I care? These products are the cheapest building blocks for a diversified investment portfolio. A fund is a pre-packaged collection of different securities (stocks and bonds). An Exchange Traded Fund is simply a fund which is available to buy or sell at any time on a public exchange, in the same way that you might buy or sell shares. Alex is a little frustrated. He wishes that there was a way to invest in trucks without having to seek out lots of different truck companies. It is expensive to buy lots of parcels of shares, and time-consuming to do the research. The Truck ETF is now available for sale! Rather than needing to buy all the constituent elements, Alex can simply purchase units of the Truck ETF to satisfy his investment requirement. If each unit were £50 then he could invest his £1,000 by simply buying 20 units. This saves him time (identifying all the right companies), money (each different share purchase is costly to transact), and risk (he is diversified across many truck companies). There are few investors who want to invest solely in trucks. Substitute ‘trucks’ for ‘The US Stock Market’ and you will have a clearer sense of ETFs’ utility. Many investors want to invest in the stock market. They understand the benefits of diversification but are reluctant to spend time and money buying a large array of different companies. ETFs are a fantastic solution. Why should I care? Understanding the difference will save you tons of money. When buying an ETF, the most important choice is between actively or passively managed funds. An actively managed fund is one in which the fund’s manager buys a few stocks stocks he thinks will go up, and so earn a return above what the market in general will make. A passive fund manager has the opposite approach. He accepts that he is not clever enough to pick the right stocks so he buys a little bit of everything on offer. Can active fund managers reliably pick the right stocks, and so ‘beat the market’? The short answer is no. I will write specifically on this phenomenon in a separate article. Active funds are much more expensive than passive funds. This is because they need to pay the salaries of the analysts and fund managers who dream up imaginative investment strategies, and for large marketing campaigns to convince investors of their brilliance. Passive funds, on the other hand, focus on keeping costs low. Because their investment strategies are publicly known and relatively simple, their competitive advantage is low cost. The cost of funds is their expense ratio. It is a percentage of the total investment which is deducted each year as a manager’s fee. In passive funds it will be between 0.05% and 0.80%, and for active funds between 0.5% and 1.5%. For example if you £1,000 invested with an expense ratio of 0.3%, you would pay £3 annually in fees. Fees make an enormous difference in returns. In the below example two investors are contributing £100 per month to their funds. The passive investor pays an expense ratio of 0.25%, and the active investor pays 1.18%. Assuming the same rate of return, the active investor ends up with GBP40,000 less at retirement! For the active investor to match the passive investor’s 40 year return he would need to put in £28 extra every month! 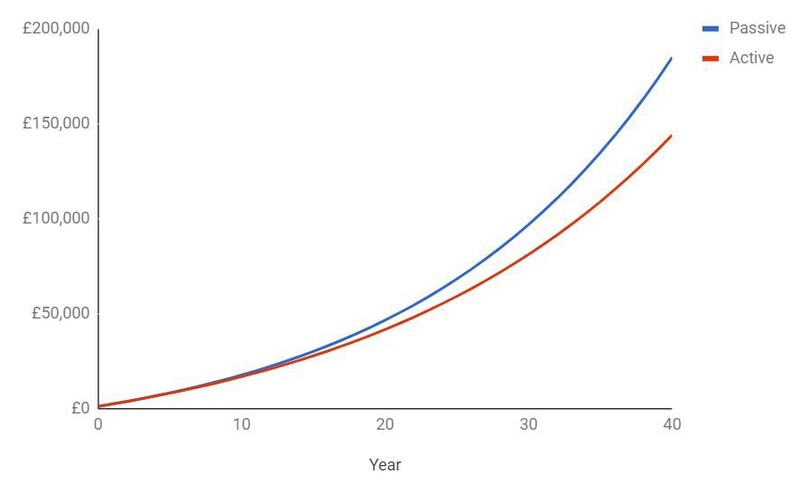 Seemingly small variance in fees can make an enormous difference in the long term. Fees are a huge drain on any investment portfolio, and should be foremost in your mind when you assess any potential investment. They are rarely spoken about because its not in most investment firm’s interests to tell you; they make more money when you buy high-fee products. The most cost-effective ways to create a diversified portfolio is to use passive ETFs. Oliver is the founder of Moneycado, a startup offering help to millennials trying to improve their money habits and knowledge. Moneycado’s next workshop is on March 1 at work.life Clerkenwell. Readers of Twenty Mile Club can get 50% off with the code ‘twentymileclub’.